People would usually say that it’s not about your tools, more than how skillful you use them. Unfortunately, the truth still remains that your skills, no matter how honed they are, could only go so far if you’re stuck with tools that are of mediocre quality. You can afford to learn this sort of lesson in cases such as photography, or even in cooking. However, you shouldn’t be leaving this sort of situation to chance, especially in cases where lives are on the line. The point here is, in the medical field, the quality of the tools you use are just as important as your level of knowledge and your overall experience. 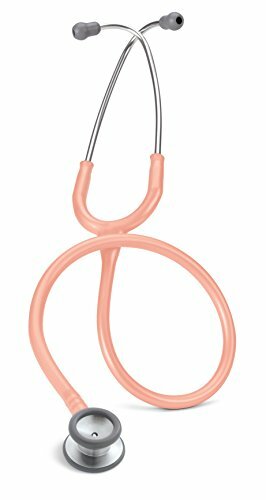 Speaking of tools, one of the devices you’re bound to be keeping close to your person at all times when you’re clocked in is the humble stethoscope. The stethoscope is an absolutely vital tool to keep in hand, especially during those times when you need to make a quick, solid assessment of a patient’s condition. When it comes to considering the quality of a stethoscope, it isn’t necessarily a guarantee that you’re getting higher quality with higher priced products. This is especially the case with the Adimals 618 Scope. As you will see, most of its redeeming qualities come from clever designs, more than in extravagant add-ons which at times may not be necessary. The chest piece is not only child-friendly in the sense that it holds these snap-on animals. 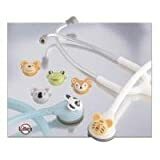 The extra effort which goes into these cute creatures wouldn’t help if the child is startled by the chill of a conventional stethoscope chest piece. This is why the bell on the Adimals 618 Scope is also developed so you wouldn’t have to spend an extra minute heating it up before placing it on the skin. This non-chill bell is supported by a specially designed rim, guaranteeing a more comfortable experience for the patient. This main component is supported by a high quality tubing, and a comfortable pair of binaurals, made of aluminum; it’s light enough to carry, yet tough enough to withstand considerable abuse. 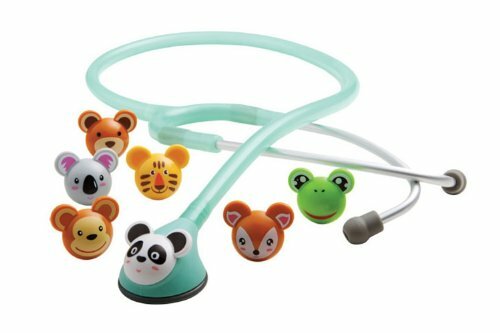 Definitely For Pediatricians – You only need to take one quick look at this stethoscope to know that it was made for the child and the pediatrician in mind. The extra effort placed into making this stethoscope entertaining makes such a huge difference. Easy To Carry And Transport – The Adimals 618 Scope is not as heavy compared to other stethoscopes, which makes it easier to take around a busy ward. Competitive Acoustic Quality – Stethoscopes ought to be known for their capabilities in delivering significant sounds which are audible and distinguishable enough for medical staff to make professional analysis. The Adimals 618 Scope is certainly able to deliver on this demand. Heart, respiratory, and bowel sounds are very clear and crisp-sounding through this stethoscope. Affordable Price – ADC is adept at keeping up with the bigger players in the medical equipment industry. While the quality of the Adimals 618 Scope is enough to keep up with more expensive stethoscopes, ADC is still able to sell it at half the price one would normally expect from the higher-end line. Slightly Flimsy Build Quality – This is certainly a lightweight stethoscope. With that said, it may not withstand drops from higher locations, or stronger yanks. People who are looking to purchase this stethoscope direct from the retailer should take extra care to inspect the earpieces and the tubing of the Adimals 618 Scope they are considering. Customization Required For Some Instances– The earpieces on this stethoscope may not necessarily fit all ears comfortably. The device is shipped as is, with no additional earpieces of various sizes. With that said, doctors with smaller or bigger ears may need to make additional purchases for their Adimals 618 Scope to work specifically for them. Certainly Not An Adult Steth – This is a stethoscope which is really just for kids. The size of the diaphragm and the chest piece is enough to ensure a good experience when trying to listen to younger heartbeats, but if you’re looking for a more flexible stethoscope in terms of people to use it on, you’re better off looking elsewhere. The Adimals 618 Scope may very well be one of the best choices you ought to consider, if you’re looking for a pediatric stethoscope. Its design alone should tell you that it will be such a great help in getting good results from a wide range of younger patients. With that being said, this is a stethoscope best used only for kids. If you’re particularly careful with the gear and tools you have, and if you’re definitely only dealing with the younger generations in terms of medicine, then this is the stethoscope for you. All these qualities are backed up with a very affordable price which won’t cause you to break the bank, as other competitive variants probably would. Stethoscopes have certainly made things easier for doctors in general. Though its function is essentially simple, this device is such an ingenious way for any medical professional to make a proper analysis regarding his or her patient’s condition. This is a certainly remarkable observation, considering the earliest stethoscope started off as a non-invasive tube for doctors of old to listen to breathing and heartbeats. In other words, the concept of the stethoscope was developed in the name of decency, simply because male doctors felt awkward pressing their ears directly on their patients’ chests, especially female patients. As you can see, today’s stethoscopes are no longer in the form of rigid tubes, but the same concept still remains – at least, for the most part. The common perception of a stethoscope today is the image of a simple, yet sophisticated listening implement which is easier in all aspects – easier to wear, easier to use, and, most importantly, easier to collect solid results. ADC’s ADSCOPE 604 is a demonstration of how far technology has brought the development of the humble stethoscope. Though it has all the essential functions of a regular stethoscope, it was manufactured with the intentions that it should be used mainly by pediatricians. Take a quick look at its design, and you will see that the ADSCOPE 604 is for taking quick and accurate readings from children. You should be able to see this after taking a quick look at the stethoscope’s chest piece. The ADSCOPE 604 features a combination chest piece made from the finest surgical steel. It has tough make and precise design to keep working like new. This is important considering that the potential patients this stethoscope would most likely be used on have a higher tendency to cause the entire device to be knocked about, or dropped more often. For additional protection and added comfort to the patient, tough rubber lines the corners on both ends of the chest piece. Housed within this casing of steel is a special diaphragm that is ultra-sensitive. With a functional diameter of 13/8 (or, 1.625, a little over one and a half) inches, this chest piece was built with the intention of getting amplified and therefore more accurate readings in a lesser amount of time. The chest piece connects to the other essential part of the stethoscope, the earpiece frame, through a high-grade tubing. This tubing is made of tough and light rubber, which is completely waterproof – not too hard, not too soft either. It is able to take on the gripping and grabbing of frisky, curious young hands. The entire tubing is considerably long; at 22 inches, this should be more than enough for most, if not all circumstances. Comfortable – The ear tips on the ADC ADSCOPE 604 have been reported to be softer and more comfortable to use, compared to other stethoscopes being sold at significantly higher prices. This is a plus, especially for pediatricians who take their stethoscopes on and off quite frequently. Competitive Acoustic Quality – Stethoscopes ought to be known for their capabilities in delivering significant sounds which are audible and distinguishable enough for medical staff to make professional analysis. The ADSCOPE 604 is certainly able to deliver on this demand. Their decision to make a wide diaphragm diameter certainly pays off. Heart, respiratory, and bowel sounds are very clear and crisp-sounding through this stethoscope. Affordable Price – ADC is adept at keeping up with the bigger players in the medical equipment industry. While the quality of the ADC ADSCOPE 604 is enough to keep up with more expensive stethoscopes, ADC is still able to sell it at half the price one would normally expect from the higher-end line. Weight Issues – While this is a cheaper stethoscope, there are a significant number of people who have purchased and tried the ADSCOPE 604 that have mentioned that it is heavier than other stethoscopes they have used before. This weight isn’t much of a concern when it comes to generally carrying the device around, say, a hospital, but it may cause some delays when actually using it. Minor Quality Concerns – Most people who have approached reviewing the ADSCOPE 604 with a more critical perspective have observed that the earpieces and/or the tube have a tendency of failing. It is possible for the earpieces would break much sooner than expected; small scratches could quickly turn to ugly tears on the tubing as well. ADC has certainly been able to deliver comparable quality at significantly lower prices. Many parents and professionals who have purchased the ADSCOPE 604 have claimed on their reviews that this stethoscope is able to deliver distinct results which are comparable or equal to more expensive variants. Of course, there will be a few bugs and defects rolling out of the factory, and it is unfortunate to the point that a very small number of consumers have voiced out their concerns. 3 out of 43 reviewers on Amazon’s page for the ADSCOPE 604 have given the product 3 or less stars, over the highest score of 5 stars. Their main reason for giving low results was poor sounds, or the ear tips and tubing failing on them. Now, this should not deter you from considering this great product; if you notice, these issues were only reported by 3 out of 43 reviewers – Your chances of getting a defective product would be less than 10%, and even then, you should be able to get a replacement sent over to you in no time at all. Even if you do lose a short amount of time, the significantly lower cost of the ADSCOPE 604 still make it a very sound investment. If you’re a pediatrician in the market for a new stethoscope for your field in particular, the ADSCOPE 604 is highly recommended for all your needs. It is a tough package able to deliver quality results, at a much lower price than you would expect. A stethoscope is the number one minimum device requirement for doctors in their profession. Doctors and medical professionals use this device to be able to listen to the sounds of the internal body of humans and even animals for veterinarians, most especially the lungs and the heart sounds. Stethoscopes used for pediatrics have numerous designs already. These quality designs make it easier for the doctors to be able to diagnose the small patients. To be able to listen clearly and accurately to the internal organ sounds of the child or infant, the stethoscope must be of the best quality. Characteristics of an ideal stethoscope includes being one that can deliver the clearest loud sound of internal organs, and one that is also comfortable and looks good at the same time. Cheap stethoscopes often sacrifice the quality of the product. Stethoscope parts are very important in the whole medical process; this is why the quality of the stethoscope used should be excellent. Stainless steel is the best material for the chest piece, as it can be machined for tolerances that are precise. It will also be able to allow the diaphragm of the stethoscope to fit it with an air tight seal. It should be sealed tight so that the performance of the stethoscope itself will not be degraded and compromised, as it acts like a drum, and that any leak even the smallest one would affect how it performs as a medical device. The stethoscope’s diaphragm must be made from a flexible material of high quality. This is the common part that is compromised with cheap stethoscopes. The stethoscope’s tube should be of a thick material; preferably one with an internal double core in a large size, as it would improve the transmission of sound and the isolation of external noises. Also, the ear pieces of stethoscope must be soft and angled, so that the ear tip will smugly fit into the ear canal. The above mentioned characteristics are for general stethoscope references. Each doctor has a specific need for their practiced field, thus they may need more complex stethoscopes at particular times. 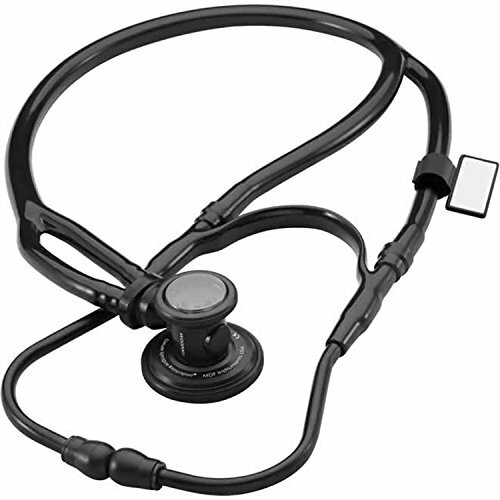 Each stethoscope shares a few basic features, such as the chest piece, tubing, and ear pieces. Also, there is a particular kind of stethoscope used for diagnosing infants and adults differently. One cannot simply use a regular stethoscope for checking children. With children, their chests are smaller compared to adults. Thus, the stethoscope to be used should also be of smaller size to fit it properly. Also, in dealing with children, since they have a smaller body, the stethoscope must be placed on a precise spot or are of the upper body of the child. If an adult stethoscope is used for children, the doctor will have a hard time focusing on the just the sounds of the specific area he or she wants to listen to. Dealing with children during a medical checkup can be very challenging. Some would not allow doctors to touch them or check them, and some would also not be standing or sitting still in the process for instance. Adult stethoscopes have a really cold bell, while pediatric stethoscopes have the non-chill bell technology; this would not startle the child with the coldness and so that he or she will be still in the whole duration of the checkup. The sizes of the pediatric and adult stethoscopes also differ. Regular stethoscopes are bigger in size, while pediatric and infant stethoscopes are smaller to cater to the size of the child or infant. Child friendly stethoscopes are also very helpful for doctors so that the child would not be afraid. In choosing the best kind of stethoscope for you, you will have to consider first the type of work you do on a daily basis, and if who your patients are. Each stethoscope is designed for a specific purpose and in order to identify what the doctor needs to know. Also, each differs in the scope of coverage, sound quality and even in its frequency range. The environment you are in is also is a factor to be considered as you might be exposed to a lot of noises in the environment, thus hearing the sounds of the internal organs may be a problem or may be difficult. All stethoscopes in the market ready for sale has its own product specifications as well. It is best to weigh your options, compare each product and brand with one another, and come up with the best choice for you. In the age range or category of your patients, the kind of stethoscope that is used also matters as the results that you will be obtaining may be affected by the kind of stethoscope you will be using. For instance, when checking a child, it is best to use a pediatric stethoscope rather than an adult one, and vice versa. The best stethoscope to have is the one that can help you in finding out the medical condition of your patients; also, one that is of great value for your money, given both the quality and its durability. Buying the most expensive stethoscope there is does not mean that it is the best one for you, same as with buying the cheapest one. There are a number of factors to consider in buying a stethoscope, the quality and durability included. One should always keep in mind that never compromise quality and durability for the amount. Yes, there are very cheap stethoscopes for sale, but these would not last for a long time and may possibly be made of cheap materials that will compromise the quality of the result you want to obtain. Given an array of brands in the market, there are quite several to choose from, and also ranging from varied price ranges. Always make it a habit to compare brands, product specifications, prices and the reputation of the brand before deciding to buy. There are 7 products highlighted in this article. First up is the ADSCOPE Adimals 618 Scope, Pediatric-22″ Tubing, Seafoam. 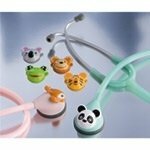 It is a pediatric stethoscope with animal face snap-ons that are interchangeable. The snap-ons include 7 kinds as follows: frog, deer, tiger, monkey, panda, koala and bear. Aside from this, it has an animal face chest piece that is made of a distinctly molded resin whose size is optimal for pediatric use. The design of such stethoscope is the American Diagnostic Corporation’s AFD technology which can switch between a diaphragm like frequency and a bell like frequency performance through alteration of pressure during use. The snap-ons would definitely get the patient’s attention away from the fact that he or she is visiting the doctor for a checkup. It would calm them and assure them that the doctor is safe and being checked by the pediatrician is not so scary afterall. The ADSCOPE Adimals 618 Scope’s bell is of a non-chill kind and its diaphragm has a retaining rim for the comfort of the patient. It also has aluminum binaurals that are lightweight and in a matching finishing of satin. 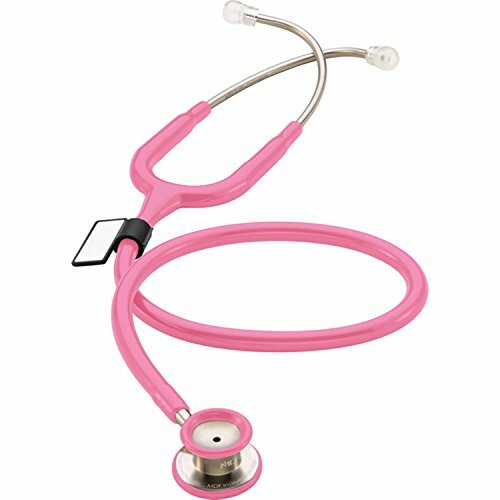 The stethoscope comes in three colors, namely: seafoam, pink and white. It weighs three ounces and is thirty inches long; it also has twenty-two inches of PVC tubing. When shipped it is said to have a shipping weight of 10.4 ounces and the buyer can choose for it to arrive within a day or after two days, whichever they prefer. The one day arrival of the item included an additional amount for it, while the two day shipping is free of charge. The ADSCOPE Adimals 618 Scope, Pediatric-22″ Tubing is applicable for the free shipping offer, and is currently in stock. It currently costs only twenty five dollars and four centavos ($25.04) from the original price of forty four dollars and twenty seven centavos ($44.27). A gift wrapping option is also available for a buyer who wants it wrapped. The ADSCOPE Adimals 618 Scope, Pediatric-22″ Tubing stethoscope is sold by the Empire Depot through Amazon. Interested in the ADSCOPE Adimals 618 Scope, Pediatric-22″ Tubing? Buy yours now. Visit Amazon.com and read for yourself the different reviews of those who have experienced the product beforehand. The ADSCOPE Adimals 618 Scope, Pediatric-22″ Tubing ranks 13190 in the Amazon.com Sales rank. It is child friendly, thus pediatricians will not be having a hard time checking their little patients as they will not be feeling too much agitation and be frightened with cute animal snap-ons listening to their internal organs sounding. Doctor’s sometimes use word play with their patients in using their ADSCOPE Adimals 618 Scope, Pediatric-22″ Tubing, such as “The panda wants to listen to your lungs.” And the child just gives way for the doctor to do so. Are you dealing with children who are panicky and frightened of the pediatrician? The ADSCOPE Adimals 618 Scope, Pediatric-22″ Tubing may be the very best product for your medical practice. Second product on the list is the ADC ADSCOPE 604, Pediatric, Light Blue 604LB. This product comes in 5 other colors, namely: Black, Gray, Metallic Caribbean, Metallic Raspberry and Pink. It has a combination pediatric chest piece which is machined in a precise way to exact tolerances from the surgical stainless steel; this is to ensure a performance that is outstanding and of rugged durability. The diaphragm of the ADC ADSCOPE 604, Pediatric, Light Blue 604LB is ultra-sensitive in nature and thus having a crisper transmission of high frequency and also a greater amplification. The bell of the ADC ADSCOPE 604, Pediatric is of a non-chill nature, with a diaphragm retaining rim for the comfort of the patient; aside from this, its bell is also color coordinated. It has a reinforcing yoke which is molded into a flexible PVC tubing of twenty two inches, and also includes a scope ID tag. The ADC ADSCOPE 604, Pediatric is currently thirty four dollars and ninety five centavos ($34.95) from the original sale price of fifty six dollars and thirty nine centavos ($56.39). It is still available and on stock and is available for the free shipping option. The buyer can have it delivered in a day’s duration for an amount or decide to avail of the free shipping which takes two days instead. The seller of this product is Corydor through Amazon.com, with gift wrapping available for buyers as well. When shipped the ADC ADSCOPE 604, Pediatric is of 11.2 ounces. Customer reviews on the ADC ADSCOPE 604, Pediatric show how excellent it is for use and in terms of durability and quality, the ADC ADSCOPE 604, Pediatric is really a good value for your money as some reviews even describe it to be as good as the more expensive stethoscopes. Depending on what the individual’s preferences are, the ADC ADSCOPE 604, Pediatric may be perfect for your needs. It is simple in design though, without any animal characters for children to get distracted, but with the six different colors of the model or product, children who come for a medical checkup would not be so much scared to go near the doctor or even scared to let the doctor examine him or her and listen to his or her heartbeat. You may check out the different product reviews online to help you gage the capacity and performance of the product. Also, an LED penlight with pupil gauge is commonly bought with it. What are you waiting for? Experience the ADC ADSCOPE 604, Pediatric yourself and get the value for your money. With their current low price, you get to save some twenty one dollars and forty four centavos ($21.44). The ADC ADSCOPE 604, Pediatric ranks 60765 in the Health and Personal care category and 267 in the Stethoscopes category. With this, rankings show the effectiveness of the product itself. Also, with the colors the product is sold in, one can choose which would match his or her preference and even personality. Third product featured is the ADC ADSCOPE 605, Infant 30.5″Stethoscope, Black. This adscope is able to carry the legendary acoustics in a version in which it is scaled down specifically for an exceptional functionality for infant patients. The ADC ADSCOPE 605, Infant 30.5″Stethoscope, Black’s diameter is 7/8 inches and provides a low frequency response which is unsurpassed. The diameter of the ADC ADSCOPE 605, Infant 30.5″Stethoscope, Black is of ultra-sensitive nature, thus having greater amplification and a of course a crisper transmission of high frequency. The product has a warranty that lasts a lifetime and it just weighs 4.1 ounces with an overall length of 30.5 inches. Its combination chest pieces are machined to be precisely exacting tolerances from the surgical stainless steel, thus having rugged durability and an outstanding performance. Designed for infants, its length is shorter than other models of stethoscopes. The reinforcing yoke of the ADC ADSCOPE 605, Infant 30.5″Stethoscope, Black is molded into the 22 inches of PVC tubing of flexible nature. Aside from this, it also has adsoft deluxe PVC eartips that come in small to large size to have an ultimate acoustic seal and wearing comfort for individuals. A spare ID tag and diaphragm is also included in the package. Buyers may have the option for a one day or two day delivery of the product. As there may be only nine units left of the ADC ADSCOPE 605, Infant 30.5″Stethoscope, Black, get yours now before stock runs out. The current price of the ADC ADSCOPE 605, Infant 30.5″Stethoscope, Black is thirty dollars and eighty three centavos ($30.83) from the original price of fifty one dollars and forty nine centavos ($51.49). The product is sold and shipped from and by Amazon.com with an available gift wrapping option for buyers. Often bought with the ADC ADSCOPE 605, Infant 30.5″Stethoscope, Black is a Pediatric Vital Signs & Developmental Milestones Horizontal Badge ID Card Pocket Reference Guide. Reviews from buyers also show that they were satisfied with their buy and it gave them the right value for their money. Some even described the the ADC ADSCOPE 605, Infant 30.5″Stethoscope, Black as one that works like the more expensive stethoscopes in the market. Also, being designed for checking infants, it is really a big help in the neonatal ward for practitioners who monitor the little angels. Having the right instruments and that of which give the quality performance, medical practitioners also are able to give more quality service to their patients and to the community as a whole. 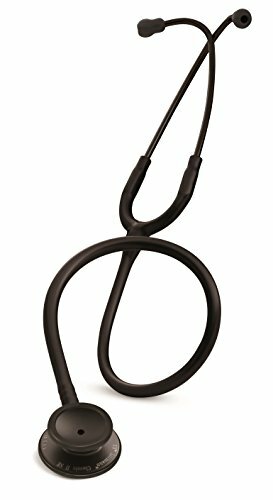 The ADC ADSCOPE 605, Infant 30.5″Stethoscope, Black ranks 52836 in the Health and personal care category and 233 in the stethoscopes category. It weighs 1.5 pounds for its shipping weight. Although, this product is not eligible for shipping internationally. It originates from Taiwan and is currently available for shipping within the United States and to APO and or FPO addresses. Grab your very own ADC ADSCOPE 605, Infant 30.5″Stethoscope, Black now and experience its excellent level of performance and beauty. 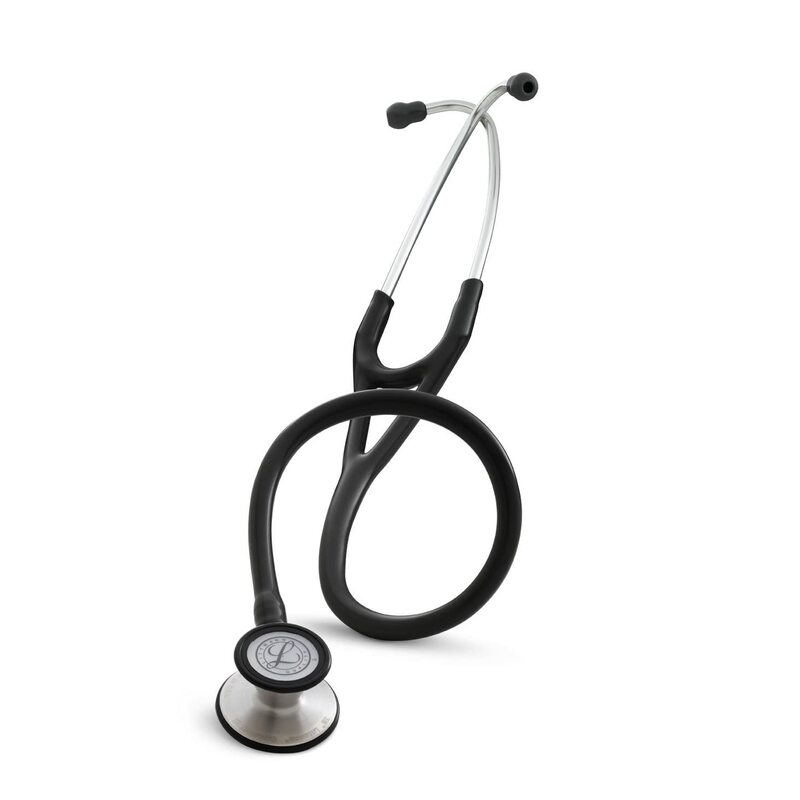 Next on the list is the 3M Littmann Classic II Pediatric Stethoscope in Multiple Sizes and or Colors. As the name suggests, this product has several kinds and colors. Currently, there are 11 items on stock. The 3M Littman Clasic II Pediatric Stethoscope is designed for smaller patients. This product is also commonly used by medical practitioners and professionals, and even students to be able to listen to and study the internal organs such as the heart, lungs, and others, for assessment and diagnosis purposes of pediatric patients. The 3M Littman Clasic II Pediatric Stethoscope is able to deliver output in a high acoustic sensitivity for both high and low sound frequencies with the use of its chest piece which is dual sided. This stethoscope also has diaphragms which are specially sized. Its tubing is resilient and is able to be folded tightly so that it can be placed inside pockets and even retain its shape afterwards. 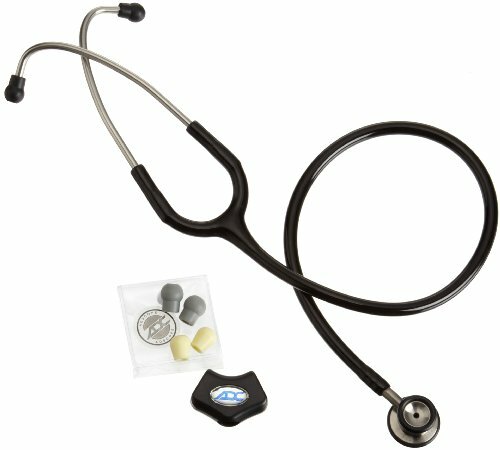 The effective acoustic seal is associated with the 3M Littman Clasic II Pediatric Stethoscope’s snap tight soft sealing ear tips which is anatomically correct and is also angled to be able to channel the sound while enhancing the listening comfort at the same time.Also, aside from these, the rim is of non-chill nature and the diaphragm provides comfort to the patient. Being made in the United States of America, the item is only eligible for domestic shipping, or shipped within the United States only; international shipping is not allowed. The product is latex-free and it also comes with an instruction manual and an alternate pair of ear tips in a small size. The headset can also be adjusted for the fit and comfort of the individual. The 3M Littman Clasic II Pediatric Stethoscope is dependable and definitely a hard working tool in clinics for the physical assessment, monitoring, and making diagnoses for smaller patients. 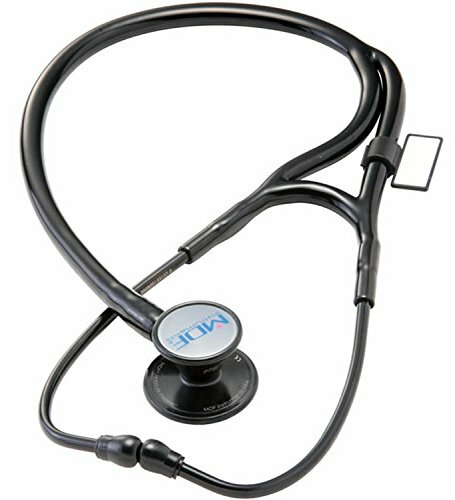 As the product comes in a number of versions, there is no specific price for it as a whole, however, the price for these kinds or versions of the 3M Littman Clasic II Pediatric Stethoscope is from seventy five dollars and ninety nine centavos ($75.99) to two hundred five dollars and twelve centavos ($205.12). Each version of the product has its own specifications and sale price. As the tubing used is that of a resilient next-generation, the stethoscope is able to provide a longer life span compared to other stethoscopes due to its improved resistance towards alcohol and skin oils; it also has a lesser tendency of picking up stains. The tubing used in the 3M Littman Clasic II Pediatric Stethoscope is also human health friendly as it is not made with natural rubber latex, thus beneficial to both sensitive patients and medical professionals. Also, the environment is protected as the next generation tubing does not contain any phthalate plasticizers. 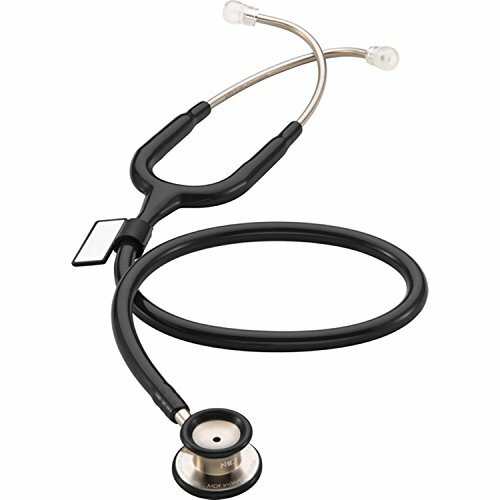 With the reputation built by the 3M Littmann Stethoscopes in the industry, its quality, durability and performance has been proven and tested already by medical professionals and practitioners alike. Number five on the list is the 3M Littmann Classic II Infant Stethoscope in Multiple Sizes and Colors. This item is 28 inches long and aside from being able to choose the color you would want, you also have the freedom to choose the king of chest piece to have. There are a total of seven colors to choose from for your 3M Littmann Classic II Infant. Also known as the industry’s standard, the 3M Littmann Classic II Infant Stethoscope in Multiple Sizes and Colors is a performance stethoscope. It has a diaphragm that is tuneable, thus allowing both the high and low frequency of sound to be heard, simply by alternating the pressure there is on the chest piece. The models in the Classic II group of both infant and pediatric stethoscopes feature the technology of the patented floating diaphragm. In addition. All the models in the Classic II category have the non-chill rim, original Littmann soft-sealing ear tips, and the single lumen tubing. The products in this category, may it be infant style stethoscopes or pediatric stethoscopes, are sized to be able to facilitate the sound sources in the bodies of smaller patients. Through a dual sided chest piece, the 3M Littmann Classic II Infant Stethoscope provides high acoustic sensitivity. The tension in the headset of the stethoscope is easily adjusted for both head size and comfort of user by just pulling apart the ear tubes or squeezing them together. The ear tips of the stethoscope are soft sealing and snap-tight in nature, thus easily compatible to the ears of individuals, and having an excellent acoustic seal as well. The ear tips of the stethoscope snap tightly onto the ends of the ear tubes, thus also will be requiring a significant amount of effort to remove, to ensure safety as well. The 3M Littmann Classic II Infant Stethoscope makes use of the resilient next generation tubing that allows the stethoscope r be able to return and retain its flexibility and shape after being placed of folded tightly into a pocket. The life of the stethoscope is also improved due to the very much improved resistance of the product towards alcohol and skin oils, and even the lesser tendency of picking up any stains. Also, a benefit of the next generation tubing is that they are not made from natural rubber latex, thus helping those individuals, both patients and medical professionals, who are sensitive not to acquire any allergies from using it. Next generation tubing also does not contain phthalate plasicizers. The Littmann quality is known to a lot of medical professionals all around the world, and the brand has built its reputation and effectivity as a product for quite some time already. Buyers of the Littmann stethoscopes always get the best value for their money, as the brand assures good quality performance of their products. With the acoustic performance which is superb, outstanding value, and having a consistently high quality stethoscopes, Littmann continues to build its brand reputation. Sixth on the list is the MDF® MD One Stainless Steel Premium Dual Head Pediatric Stethoscope – Purple (MDF777C-08). The stethoscope itself is constructed from an acoustically superior stainless steel. It is able to deliver an auscultation of the heart, lungs, and others in an accurate manner. Its design is ergonomic and ensures the comfort of both the doctor and the patient. The chest piece of the MDF® MD One Stainless Steel Premium Dual Head Pediatric Stethoscope is made of stainless steel and is handcrafted. It is machined in a detailed manner and hand polished to ensure the durability and high quality performance of the products. The tubing used for the product is of a denser, thicker, and latex free PVC, and the non-stick acoustic tubing in the Y-configuration provides superior transmission of sound and also sealing out of the ambient noises, while at the same time preventing the wearing and cracking that might occur due to repeated use. The headset of the MDF® MD One Stainless Steel Premium Dual Head Pediatric Stethoscope is pre-angled, hand polished stainless steel. This is to ensure that there is durability and custom fit for users. Also, the ear tips of the stethoscope are clear for hygienic purposes and to be able to clear and seal out the extreme noises while at the same time ensuring comfort during the extended use of such. With this, there are also two extra sets of ear tips, a spare diaphragm which is ultrasensitive and an ID tag. The original safety lock of ear tips are non-invasive in nature and is leading in the industry for user safety. The MDF® MD One Stainless Steel Premium Dual Head Pediatric Stethoscope also has a warranty that lasts a lifetime. The MDF® MD One Stainless Steel Premium Dual Head Pediatric Stethoscope comes in thirteen colors, but as of now, there are only three available colors, namely: Purple, Black and Pastel Blue. The stethoscope is priced at fifty four dollars and ninety centavos ($54.90) from the original price of sixty four dollars and fifty nine centavos ($64.59). It has been handcrafted since the year 1971 up to present. It is ranked the 227319th in the Health and personal care category and 868 in the stethoscope category. Some customers who buy the MDF® MD One Stainless Steel Premium Dual Head Pediatric Stethoscope also buy the CMS 5—DL Oximeter with neck or wrist cord together with it. The stethoscope weighs 15.2 ounces when shipped. 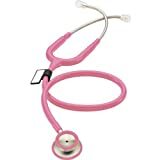 Its Amazon sales rank is 223185.The colored stethoscope is used by pediatricians as it is also child-friendly. Grab your very own MDF® MD One Stainless Steel Premium Dual Head Pediatric Stethoscope now. Read the different reviews and testimonies of those who have bought and experienced the product first hand, to know more about what the product can do and if you can get the value for your money. It is being sold by MDF Instruments Official, through Amazon. There is also a gift wrap option available for buyers. Last on the list is the MDF® Sprague Rappaport Dual Head Stethoscope with Adult, Pediatric, and Infant convertible chestpiece. The product comes in ten colors to choose from. This stethoscope is 5 stethoscopes rolled into one and is used for a fullest range of diagnostics. It is a trusted tool for detecting the sounds of a faint heart and murmurs. And this is considered to be the most versatile model of stethoscopes since it can be used for assessing adults, infants, and pediatric patients with just this single stethoscope. It has an ergonomic design thus, comfort of both doctor and patient is ensured. The chestpiece of the MDF® Sprague Rappaport Dual Head Stethoscope is handcrafted and made from a gold-plated zinc-alloy. It has a full rotation and dual output valve acoustic stem with an indicator dot in green color to allow the users to be able to identify that active sound channel. Also, the stethoscope has an accessory kit containing diaphragm assemblies that are removable and can be replaced with bells for adults, infants, and pediatric. The ear tips of the MDF® Sprague Rappaport Dual Head Stethoscope are made of soft silicone and are clear for hygienic purposes and phthalate-free. For sound to be isolated and to ensure a proper fit, the ear tips are available in small, medium and large sizes. 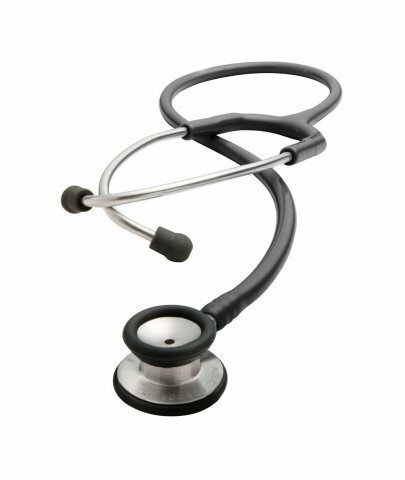 The stethoscope has a pre-angled headset made of stainless steel and is hand polished featuring a patented internal dual leaf spring construction for durability and safety of the user. The stethoscope has a latex-free PVC tubing which is denser and thicker. It is also a dual non-stick acoustic tubing which provides insulation for the superior transmission of sound and sealing out of noise, while at the same time being able to prevent the wearing and cracking that occurs when used repeatedly. The dual acoustic tubes are high performing and are secured in a place by chrome-plated brass that has acoustic tube clasps that are non- obtrusive and non-pinching. Other accessories included in the kit of the stethoscope are spare pediatric and adult clear PVC diaphragms, extra sets of ear tis, pediatric bell, infant bell, pediatric diaphragm assembly and an ID tag. Materials used in the manufacture of MDF Stethoscopes are ensured to comply with the local regulations, and they see to it that their products are non-toxic, non-phtalate, non-hazardous, latex free and many others. This is also to protect both the patient and medical communities. 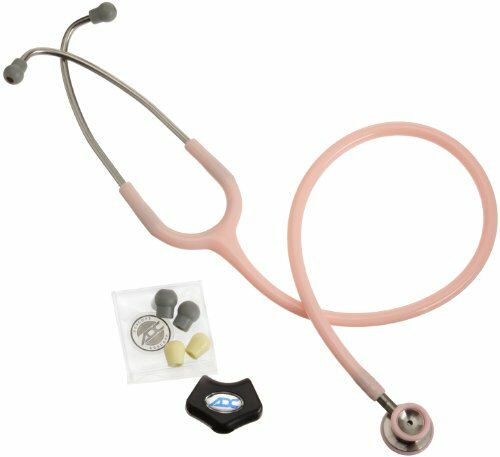 The MDF® Sprague Rappaport Dual Head Stethoscope is currently on sale at only thirty one dollars and ninety eight centavos ($31.98) from the original price of thirty seven dollars and sixty three centavos ($37.63). In choosing which stethoscope to purchase, it should always be a habit to compare different brands and the product specifications, to know which one will be the best fit for you. This is also to allow buyers to get the value of their money and to be regret free after purchasing a particular stethoscope. Also, consider what kind of patients you have.